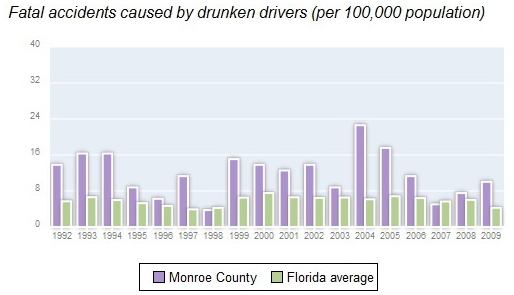 It almost invariably happens the same way for many people who travel the roads of Monroe County, and Key West in particular. You are driving on Flagler Avenue, or Truman Avenue, or North Roosevelt Boulevard, when, out of nowhere, a distracted driver crashes into your car. Invariably, the at-fault driver who caused the accident will exit his vehicle and offer an apology while asking if you and everyone in your car is ok. An officer from the Monroe County Sheriff’s Office will respond to the scene, listen to all parties involved and will issue a citation to the negligent driver. If you are hurt in the incident, the severity of your injuries will dictate how your personal injury claim will be handled. The magnitude of your injuries is the only variable in this scenario. While approximately 75% of drivers have insurance (as is required by Florida law,) the majority of insured drivers are under-insured and do not carry enough insurance coverage to compensate the people they have injured in a car accident. In Florida, Bodily Injury Liability (BIL) coverage is not mandatory, and when a person purchases BIL coverage, the minimum amount of coverage is $10,000 per person / $20,000 per accident. 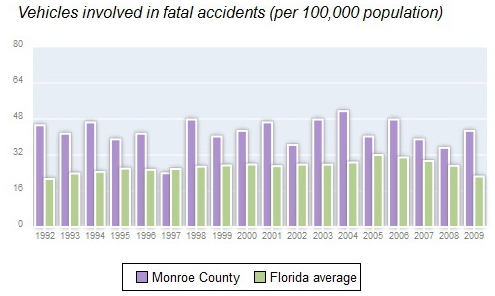 In Key West, and Monroe County, traffic accidents are sadly a very common occurrence. That reality is due to several factors, but none bigger than tourism. 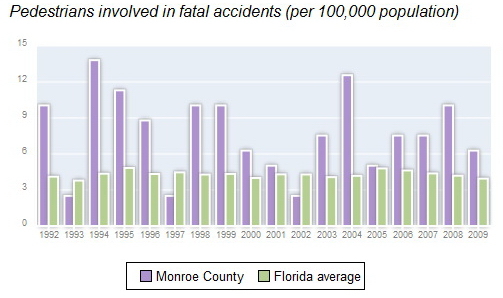 In 2011, airplane passengers arrivals to Monroe County increased by 32.8 from 2010. Tourist and recreational sales increased by 11%, and hotel room rental revenue increased by 17.5%. Tourists are crucial to the economy and livelihood of Florida Keys inhabitants. They will consume a lot, and with that comes alcohol consumption. Many tourists will also rent scooters or mopeds to move around the small town. Since the opening of our Key West office in 1987, the personal injury lawyers of Leesfield Scolaro have litigated hundreds of traffic accident cases in the Keys. Last week, Partner Thomas Scolaro filed the firm’s latest lawsuit against a negligent driver who rear-ended another vehicle on Palm Avenue, in Key West, and caused bodily harm to its driver. After 26 years and counting, Leesfield Scolaro are continuously representing clients involved in “small” accidents, as well as catastrophic or wrongful death tragedies stemming from car accidents, industrial accidents, premises liability, or inadequate security claims. Whether you were the victim of a rear-end collision and sustained injuries, or were the victim of a much more violent or life-altering event for which a third-party is responsible, the Key West lawyers of Leesfield Scolaro will always be available to speak with you and offer a genuine, and unbiased legal consultation. Tagged: "Injury Lawyer Key West", "Injury Lawyer Miami", "Key West Attorneys", "Key West Car Accidents", "Key West Lawyers" and "Thomas Scolaro"